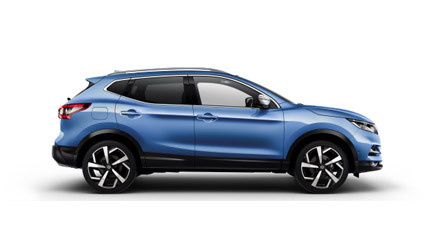 "Very professional and knowledgeable members of staff who answered all of my questions "
Read our customers' honest and impartial Nissan Qashqai car reviews and ratings to easily find your next car at Motorparks. I am pleased with my new car but have some regrets changing from auto to manual. It is smaller than my old car but looks really nice it is quite poewrful and good on desiel and comfortable. After looking at the Peugot 2008, the Mokka and Captur, we decided to take a look at the new Qashqai accenta plus, having had a test drive of the 1.2 petrol auotomatic turbo engine we were so surprised at how well it responds when driven and so comfortable to drive. We would certainly recommend anyone to have a go, you will love it, just like us. This is my third Qashqai and I love it, getting used to the switch handbrake and intelligent key - colour magnetic red is lovely. Had our Qashqai for about six weeks and we like it a lot. We did have one little glitch with it after about two weeks which was with the keyless ignition - had to call out the RAC because it wouldn't start after we'd been shopping. The RAC mechanic said it was a rare thing and would probably not happen again, he just reset something. We have had no faults since. We do enjoy the car. It does really well on fuel consumption and has some great tech on board. Would have preferred a space saver wheel kit in the boot but it seems that a lot of manufacturers use the temporary repair kits these days and will only supply space saver kit at extra cost. Overall the car is great. Car is really good. the inside is spot on - love the screen - cannot fault it. There's no front camera, but no big deal. Great car. Love my new Nissan Qashqai, really nice drive, cameras make parking very easy. Very spacious plus looks great with panoramic roof! Best feature is that the wing mirrors fold in automatically when you lock the car. Worst feature is the horn which is so quiet it wouldn't be much of a warning! Lovely car to drive runs very smoothly and is an easy car to drive. Love the ink blue colour and the higher raised driving position. I picked up my new shape Qashqai early this month and am very pleased with it. I previously had the old shape and liked that one but this has a nicer interior more in keeping with the high end vehicles like the Evoque. Lots of little extras, found out the other night the main beam turns itself on when a car is coming the other way!!! Just one annoying point, very very disappointed it did not come with interior mats, its the first car I've had where I have had to buy the mats especially in this price bracket! Picked up a nine month old Nissan Qashqai. Fantastic car! Would recommend to anyone! Delighted with the Nissan Qashqai DiG T Acenta I bought from Warrington Motors on 28/3/16. Drives superbly and a very comfortable ride. Also I'd like to complement the salesman Matthew Yates for his patience, courtesy and consideration as we went through the purchase process and for picking me up at Warrington Bank Quay when I collected the car on 30th March. Review to date is absolutely blooming awesome!!! Very pleased with my purchase.